What are PDF Portfolios and why would I need them? The short answer is: you wouldn't. The simplest and most straightforward method is to use whatever program was used to create the PDF (Word, Excel, etc) and generate the total content placing the output in one file. This may be a multiple page word document saved into a single file. Since it is a single file and not a portfolio, all users should be able to read the content without problems. This also has the benefit of allowing users to control bookmarks, page numbers, and styling information to ensure a consistent appearance. A second approach is to not combine the PDF files at all. Instead, just zip up the folder of documents using a zip program. This zip can then be sent via email. The end user receiving the zip file can unzip it and pull each PDF files from it and use it as normal. Since there is no combining process, all page numbers and formatting should be consistent within the document. In the end, if both author and reader are using up-to-date software, viewing the portfolios may not be an issue. Adobe Acrobat (http://www.adobe.com) – the commercial application from Adobe used to create and manipulate PDF documents and content. Not free. Adobe Acrobat Reader (http://get.adobe.com/reader/) – adobes native tool for reading PDF Files. Free and downloadable, it exists for multiple platforms. It is free. Though there are several third-party pdf software applications online, this could also introduce inconsistencies. How do I log in to Banner? CWID is an 8 digit personal identification number given to every student, faculty, and staff member. This replaces the previous system using social security numbers. Who can I call if I have questions about my CWID? Contact the Helpdesk at 318-342-3333 of email us at helpdesk@ulm.edu. I don't remember my CWID, how do I reset it? Contact the Registrar's Office at 318-342-5262 if you are a student, or contact Human Resources at 318-342-5140 for employees. How long is my student email account available? "Your ULM assigned Warhawks email account is soon due to be purged from the University systems. In accordance with current policy, Student email accounts are removed from the system whenever a student is no longer enrolled at the University for more than six months. Since enrollments follow semesters, we usually delete accounts during Fall and Spring semesters. This schedule allows a recently-enrolled student to retain a Warhawks account across multiple semesters, over a full semester of absence, or through the Summer sessions. If a student has not been enrolled at ULM for a significant period of time, the account is eligible for removal. Any re-enrollment or re-admission to the University will trigger the system to automatically create a new account for use within 24 hours of this admission process. The University is not responsible for content that may exist in the account. This content may include, but is not limited to, old course materials, archived email, or personal files. Students will be responsible for the retrieval of any materials in the account prior to the account deletion. Once the account is removed, all materials within the account will be gone and no longer available. An email account purge does not affect the ability to review academic status through Banner Self-Serve. Accounts may be purged as soon as 2 weeks from receipt of this notification." FlightPath is ULM's online advising and degree audit system. It was developed by the ULM Information Technology's Web Programming group, with help from the Mainframe Programming group and support from the Student Success Center and the Office of Academic Affairs. What does Flightpath do for students? Students can log into FlightPath and see their degree plans online. The courses they have already completed, plus their earned grades and credits for those courses, appear within the degree checksheet. Students can see their degree plan broken down by year (Freshman year courses, Sophomore year courses, etc) or by type of course (Major requirements in one column, electives in another, etc). Students can see what they have left to take to graduate, as well as explore what options they have for electives.Students can also use the "What-If" feature to see how their current credits could apply to other degrees, should they decide to change majors. This is probably the most interesting feature that FlightPath has to offer. Try it out and see. Undergraduate students, faculty & staff who advise, and faculty and staff who perform degree checkout duties are the targeted user groups. What does Flightpath do for an Advisor? Advisors can log into FlightPath, and then choose a student to advise electroncically. The courses a student has successfully completed appear with maroon check marks beside them, and courses they have left to take appear with blank check boxes beside them. To advise a student to take a course is simply to check that checkbox. Groups of courses have clickable icons where you can choose a course within the group. Advisors can also leave text comments discussing their advising sessions.The "What-If" feature is useful for advisors too; if a student's major hasn't yet changed, but a student still wants or needs to be advised in a major other than the one s/he is currently assigned, then the advisor can pull up that student in the "new" major through What-If and advise him or her that way. Try it out and see. How do I log into Flightpath? Log into the myULM Portal with your email username and password. Once logged in, click on the "Campus Systems" tab. Below, you will see a link for Flightpath. Click this link and you will be logged into the Flightpath system.You may also log in directly by visiting http://www.ulm.edu/flightpath. Your login credentials are the same as MyULM (your email username and password). I can't log into Flightpath, what is the problem? The first step is the call the Help Desk at 3333. If they cannot get you through the login process into the system, then they will send you someone who can. You may have to leave a message, but rest assured your call will be returned.NOTE: Only faculty and staff with advising and/or degree checkout responsibilities have access to FlightPath. If we find that you do not have access to FlightPath, but in fact you should, please ask your immediate supervisor to contact Barbara Michaelides or Angela Robinson in the Student Success Center (x 5550). Ok, I am logged in. Now what? We hope that FlightPath's tabbed navigation system and point-and-click-heavy interface will come across to you as intuitive and easy to use. If you are a student, click the View tab to see your credits applied to your chosen degree plan. You can also click the What If? tab to try out another degree. If you are an advisor, first select a student by searching on the Advisees tab. What if something on Flightpath doesn't work that I know should be? We have a contact link at the bottom-left of every page. Just click the link, select a category, and send us an email with the description of the problem. We'll look into it and get back to you as soon as possible. Will FlightPath's record ever be equivalent to my official student transcript? No. Your transcript is a legal document, and is the absolute last word as far as your university record is concerned. FlightPath will never replace the University transcript. As an Employee, can I login to and access lab computers? - Ensure that computers are available for student use in student-funded labs or to those directly assisting with student functions. - Lab and workstation utilization can be tracked and assessed for program enhancements, expansions/replacements, etc. - Logging into the lab computers will automatically connect the user to a personal file storage folder on Spock (departmental file shares are NOT connected). This means any files stored in a personal Spock account are immediately available on a lab computer after log-in. Current students wishing to use lab systems must log-in using their myULM credentials (email username and password). Once logged in, all computer resources are available including the metered print functionality. Note that students who are denied access may need to update their myULM password to gain access. Several labs on campus are used by faculty to assist with advising, presentation during PREP sessions to orient new students to ULM, and to provide individual assistance with class assignments and projects. The need for faculty access to these systems was considered necessary. Consequently, the access mechanism has been expanded to incorporate employee log-ins and subsequent lab usage. For employees to gain access to these lab computers, it is mandatory that their current myULM/email password be changed. Once the myULM password is updated, the lab control mechanism will recognize this new password and allow access. Changing the myULM password will change it for all ULM systems (except BANNER) and allow lab computers to be used. The myULM password may be changed at any time by logging into myULM (https://my.ulm.edu ) and navigating to the "Campus Systems" tab. The password reset tool can be found there. Please contact Information Technology if you still need assistance with a password change.When a lab computer is used, this access mechanism will require a correct logon and a proper log-off to protect files and prevent others from using personal resources. The "Log out" button can be found in the upper left corner of all computer stations that require a log-in. Do not leave your account active for another user to stumble upon. Before making any log-in attempt, please review and acknowledge the security policy statement found at http://www.ulm.edu/it/use-policy.html. Faculty, please remind your students to "Log out" before leaving your lab/classroom. I cannot access certain services or games online, why is that? The university has a firewall in place to provide protection to systems on our network. Our firewall is configured to only allow certain traffic in and out and does not allow many games and services, that require a port other than 80, to communicate.Exceptions can be made for software that is used in an official university capacity and requests may be routed through the call center (ext. 3333) for approval. How do I set up my ULM provided storage as a windows drive? Step by step directions for mounting your personal storage space on ULM's Spock server can be found in this document: creating a mapped drive .pdf. A website is not appearing correctly or not at all, why is that? If you find a website that is not functioning properly it may be due to a web browser incompatibility. First check to make sure that you are using the most current version of your web browser. If you are using Internet Explorer the most current is version 8. If you are still running version 6 or 7 you can download and install the update at www.windowsupdate.com. If there are other updates listed but not IE8 you must install them before it will allow you to get IE8. Alternatively, you may download a third party browser such as Firefox or Safari. Members of Information Technology recommend Firefox as their preferred web browser. There is no sound for the Smart Board technology in my classroom, is it broken? There are a couple of causes for this. First ensure that the sound on the machine has not been muted. If that checks out then you need to check the back of the computer to see if the audio jack has been pulled loose from the computer. Some instructors plug in pen drives to the back of the machines and sometimes pull them out too far, disconnecting the audio in the process. If that also checks out and there is no sound, contact the callcenter (ext. 3333) for further assistance. I had an advertisement pop up on the internet, am I infected with something? If you are only receiving popups when you go to certain websites then they are most likely part of the website.You can use a brower like Firefox that is more secure and has built in pop up blocking to reduce the number of pop ups you see from sites. If you are getting the same popups no matter what site you are on then you may have an adware/spyware problem. You can download a free malware scanner such as malwarebytes to scan and remove these kinds of problems. If you continue to have problems after running this program, contact the callcenter (ext. 3333) for further assistance. My computer is very slow, can you fix it? The three most common reason for system sluggishness is the system needing a reboot, too little system memory for the programs you use regularly, and a malware infection. 1. Begin by shutting down your computer completely and then power it back up. Restart the machine at least 3 times and see if the sluggishness is still happening. A) Go to "start" --> "settings" --> "control panel", then choose the "system" icon. B) In the system properties window that appears it should tell you how much memory you have in megabytes (MB).Most people on campus are using Windows XP SP3 (service pack 3). The system properties window will tell you what you are using. Information Technology recommends a minimum of 1 gigabyte or more of memory. If you run multiple applications at once you may want to upgrade to 2 - 4 GB (1 gigabyte is roughly 1000MB) of memory. New computers ordered for campus are required to have a minimum of 4 gigabytes of memory per state mandate. You may also turn off some of the windows visual elements in the system properties to save memory. C) While still in the system control panel, choose the "advanced" tab then click "settings" in the performance box. Uncheck all but the last 4 boxes and click "ok". This will turn off little noticed visuals and will vastly free up memory. If an upgrade in memory and reducing visuals does not fix the problem, contact the callcenter (ext. 3333). A) You have over a gigabyte of memory and only have a single program open and it is very sluggish in responding to commands. B) Any and all website you go to have the same popups. C) You find a new "antivirus" icon that pops up telling you that you have a virus.If you experience any of the above malware symptoms please call the call center (ext. 3333) for help diagnosing the issue. My (mouse, keyboard, etc.) quit working, what should I do? If a peripheral device quits functioning try reconnecting the device, checking batteries, re-syncing, and then rebooting the computer. If this does not work contact technical services through the call-center (ext. 3333) to see if the device is still covered under manufacturer warranty. If it is not under warranty then you may purchase a new one at most any store that carries computer accessories. The University Information Technology does not have extra devices to hand out. Trend Micro found a virus, what should I do? Usually when it finds a virus it automatically tries to delete the viral file. In the message box that pops up it will tell you the action taken. If you wish to be sure it is gone from your system you may do a full virus scan by left mouse clicking the blue circle in your lower left hand corner of your screen. When you left click it a menu will pop up and you will choose "officescan main". This will bring up the scanning window for trend micro. Choose your drive (should be c:\) and click scan. If it finds viruses and says it deletes them scan once more. If there are still viruses, please contact the helpdesk@ulm.edu for further help. My computer is saying "limited or no connectivity", what is the problem? This means that your computer is able to detect that a cable is connected but it cannot receive a signal from the outside world. There are a few things to check before requesting help. If connection resumes normally after any of these steps there is no need to do the rest. 1. Unplug and reconnect the ethernet cable (looks like an oversized telephone connector) on the back of your computer, then the other end at the wall jack. 2. If you have a ethernet switch or hub connecting multiple machines in your office, unplug the cable going to your computer and move it to another port on the hub. If it works in another port then you have a bad port and it might only be a matter of time before the other ports fail. 3. Some machines will not renew their IP address properly and have to manually be refreshed. Click "start", then "run". In the box that pops up type "command" then click "ok". A black box with white letters will pop up. In this box, type "ipconfig /release" and press "enter" or "return" on your keyboard. Wait a moment and it will tell you it is done. Next type "ipconfig /renew" and press "enter" or "return". Wait a few moments and it should tell you what your IP Address is. All campus addresses should begin with a 10.x.x.x (the x being other numbers). If it renews ok and does not have a 10.x.x.x address, please contact the helpdesk@ulm.edu. How do I log in to the myULM portal? How do I use the myULM portal? Your warhawks username is the the same as your email address and the same as your moodle username. If your mail address is 'user123@warhawks.ulm.edu' then your username is 'user123'. If you do not know what your email address is and do not know your moodle username you may use this online form to lookup your username using your CWID. I can't remember my Password for access to myULM, webmail or moodle. Call the helpdesk at (318)342-3333 or email the helpdesk@ulm.edu. I can't remember my Password to access Banner. Call the Registrar’s office at 318-342-5262 (during regular office hours). CWID is an 8 digit personal identification number given to every student, faculty, and staff member. If you have recieved an email from the Financial Aid Office, you can locate you CWID (Campus-Wide ID) in the salutation section. See example below. 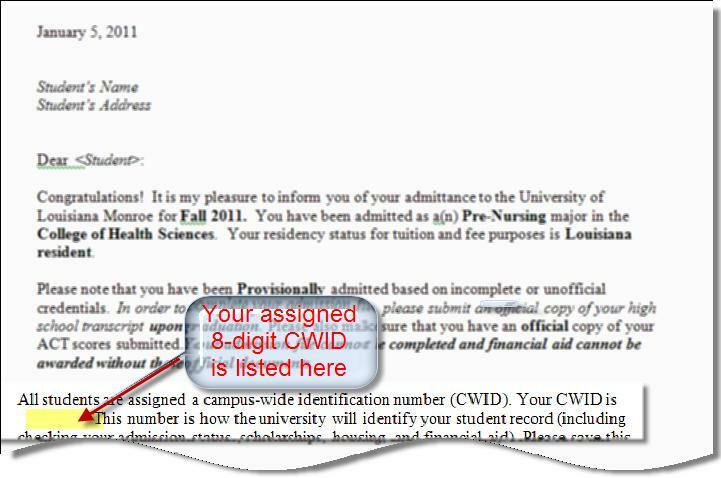 If you have received an acceptance letter from the Admissions Office, your assigned CWID is listen in the letter. See example below. 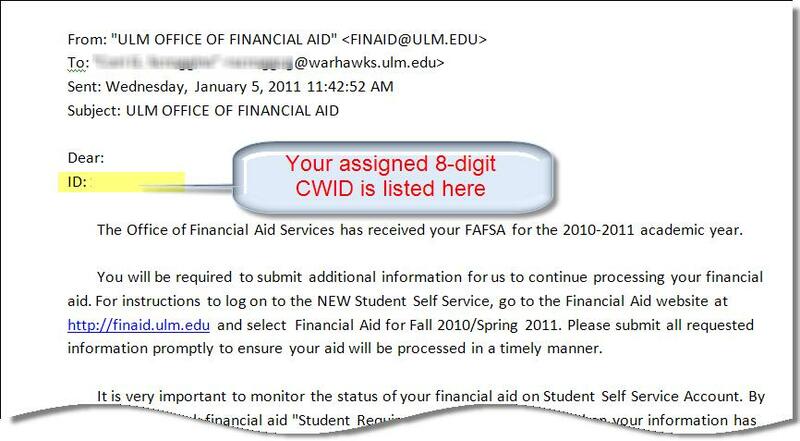 You may also log in to Banner at http://banner.ulm.edu using your SSN and PIN to locate your CWID. Click here<--anchor to earlier 'how to log in to banner'-->to watch the video 'How do I log in to Banner?'. I can't remember my Password for access to myULM, webmail or moodle. Call the helpdesk at (318)342-3333 or email the helpdesk@ulm.edu. I can't remember my Password to access Banner. Call the Registrar’s office at 318-342-5262 (during regular office hours). Please refer to section on 'Adobe'. The ULM Mobile app is an innovative and portable way for students, staff, and faculty to have instant access to the ULM systems they use the most, like email, FlightPath, and Moodle. What phones and devices are supported? ULM Mobile is available to iPhone and Android users running updated versions of their phone's software. Visit either iTunes or the Android App Marketplace and search for "ULM". For Blackberry, Palm, Windows Phone, and all other smartphone users, you may access a special web-based ULM Mobile version by visiting http://ulm.edu/m on your mobile web browser. How do I log in to ULM Mobile? Current students, staff, and faculty members may log into ULM Mobile for access to their email, schedules, moodle and FlightPath. After clicking the "Login" icon on the screen, simply enter your myULM username and password. This is the same username and password you use to access myULM. Your username is the first part of your campus email address. For example, if your email address is johndoe@warhawks.ulm.edu, then your username would be "johndoe". If you are not sure of what your email address is, you can search for yourself using the ULM Directory. Please be aware that new students and staff members may take 1 - 3 days to be fully integrated into ULM systems. If you have lost or forgotten your password, you will need to contact the University Help Desk at (318) 342-3333. Why am I missing the FlightPath (or other) icons? If you are a faculty or staff member logging in to ULM Mobile, you will not have the same icons available as students. For example, you will not have a FlightPath icon. This is due to a policy requirement at the state level. However, you may still access FlightPath on your mobile phone! Simply visit http://ulm.edu/flightpath on your phone's browser. If you are a student and you believe you are missing icons (for example, the Inbox icon), this may represent an issue with your campus account. Please call the ULM Help Desk at 318-342-3333, or emailmyulmadmin@ulm.edu for more assistance. I cannot access certain services or games online. Please refer to the section on 'general topics'. 802.11 is a standard that was developed by the Institute of Electrical and Electronic Engineers (IEEE). It is the original wireless specification. Extensions of the 802.11 standard were given the same number with a letter suffix. 802.11 Provides up to 2Mbps transmission in the 2.4GHz band. 802.11b Provides up to 11Mbps transmission in the 2.4GHz band. 802.11a Provides up to 54Mbps transmission in the 5GHz band. 802.11g Provides up to 54Mbps transmission in the 2.4GHz band. Can I use a PDA or Smart Phone to access the wireless network? Yes. While on the ULM Campus, you may find three unique wireless networks advertised to your device. Choose one of the three following: "ULM Student", "ULM Faculty","ULM Guest". Once your device shows a connected status via the selected network, you will need to launch a web browser on your device to view the authentication/disclaimer page. Once confirmed your device will have access to ULM's network resources. I have problems connecting to the wireless network, what should I do? If you still have problems connecting to the wireless network, contact the Call Center (ext. 3333). What can I do on ULM's wireless connection? browsing as for web types of http or https (ports 80 or 443). **Effective on Feb. 15, 2012: Moodle will not be available on the ULMGuest network. I have a laptop but I don't have a wireless card, can I borrow one from the ULM Library? Currently we do not have any wireless cards to check-out. Why is my wireless connection so slow? Wireless transmission can be affected by a variety of factors including walls, metal objects, trees, and distance from an access point. In addition, wireless is a shared resource. As a result, the greater the number of wireless users connected to a particular access point, the lower the effective bandwidth that will be available to each individual user. What is the speed of the wireless network? The 802.11a/g/a standard provides transmission speeds of up to 54Mbps. This is the theoretical maximum speed. In reality, the actual throughput will be 11 to 5.5Mbps or less.